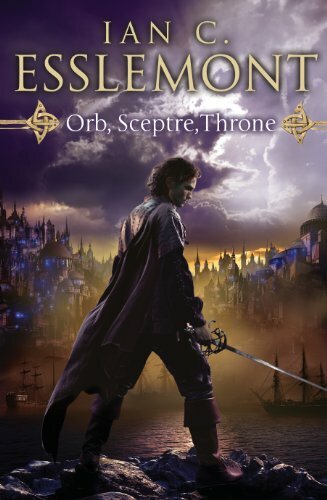 Orb, Sceptre, Throne is the fourth book by Ian C. Esslemont set in his co-shared Malazan world. It was released earlier this year and will be followed by Blood and Bone at the end of 2012. Far to the south, fragments of the titanic Moon's Spawn have crashed into the Rivan Sea creating a series of isles... and a fortune hunter's dream. A Malazan veteran calling himself 'Red' ventures out to try his luck -- and perhaps say goodbye to old friends. But there he finds far more than he'd bargained for as the rush to claim the Spawn's treasures descends into a mad scramble of chaos and bloodshed. For powers from across the world have gathered here, searching for the legendary Throne of Night. The impact of these events are far reaching, it seems. On an unremarkable island off the coast of Genabackis, a people who had turned their backs upon all such strivings now lift their masked faces towards the mainland and recall the ancient prophesy of a return. Orb, Sceptre, Throne is more of a follow-up in an arc that would include Gardens of the Moon, Memories of Ice and Toll the Hounds. It's imperative that you read these books (and even RotCG and Stonewielder) before picking up Orb, Sceptre, Throne. It seems that Esslemont is not only following his own characters, alongside Erikson's tale, but the author is also clearly finishing storylines set by Erikson, a kind of compilation of Unfinished Tales of the Malazan world. This fact is even more apparent since both the threads followed and started in the book come to a conclusion. As with most of the Malazan books, it's somewhat hard to write a review wrapping up every storyline present in the novel. From Esslemont previous works, aside from some appearances from Topper and Traveller and the Tayschrenn/Kiska/Leoman story arc, those who loved the bands from the Phoenix Inn and K'Rul's bar will be pleased... and not to forget the Moranth, Brood and the Rhivi but even more excitingly, the Seguleh! Finally, we are given more than one point of view from them, they actually stand at the heart of the book. That's actually a blessing and a small curse. The blessing being the discovery of their fighting prowess, reputation, social behavior and homeland, but then, they didn't feel consistent all the way to the end... even for the Second, who is a great addition to the cast for the better part of the book. Darujhistan is the principal setting but with Antsy going on a trek to the Spawns (the remains of Moon Spawn south of Genabackis), some Malazan marines in Pale and in the south and the Shores of Creation for Kiska, there's room enough for diversity. Still, you must have noticed that in that lot, most of the protagonists were written by Erikson. I always loved Kruppe and was kind of wary of Esslemont's take on the rotund eel. Truthfully, he went beyond my expectations. The characters are not exactly the same but they are well written and feel authentic enough. Another aspect of Esslemont writing stood out in his latest book that I didn't notice before, the fighting descriptions. The Seguleh are incredibly skilled sword fighters and they usually kill someone in a heartbeat. That is really cool, even more so when they clash against the Malazans leaving them short of several limbs. However, and not only for the masked prodigies, the fights are almost always way too short, in length and in description. As with the author's previous books, humor is always around the corner. It's coming from the adventures and dialogues of Kruppe, Baruk's pet demon Chillbais and the double act swords for hire, Scorch and Leff. Once more, Esslemont writes huge chapters with a score of point of view switches that are not always consistent in term of pace and coherence. The inevitable convergence occurs and even though many storylines were compelling, I still had some problems with the principal goal for Antsy's quest and the Darujhistan masterminds objectives. In the end, I would recommend the book to the Malazan fans but more as a bonus for the Malazan lore and the love of the protagonists than as a must. Esslemont is a good writer but I didn't feel real improvement in comparison with his previous work. I hope he can find himself in the same territory as he was in RotCG for his next book. Technically, I think the Tor cover by Steve Stone is not bad, but mostly for the color scheme and depiction of Darujhistan. A map of the city and of south Genabackis are present but they should have included a map of the northern part of the continent. A Dramatis Personae is present as usual and the paperback edition of the novel stands at 605 pages.